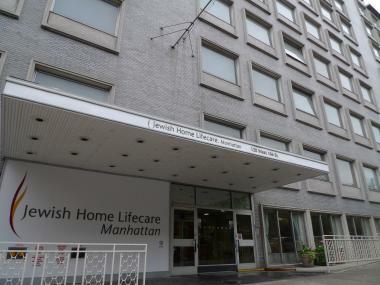 Skilled nursing facility Jewish Home Lifecare wants to replace its aging West 106th Street facility with a new building on West 97th Street. UPPER WEST SIDE — A controversial plan to build a 20-story nursing home to West 97th Street faces an important hurdle Tuesday when Community Board 7 votes on whether the project should face public review. Jewish Home Lifecare wants to break ground on the new facility in 2014, but that timeline could be derailed if the development has to go through the city's lengthy — and expensive — public review process, said Ethan Geto, a spokesman for Jewish Home Lifecare. Jewish Home Lifecare says its new building shouldn't be subjected to months of public hearings and environmental studies because the nursing home, slated to be built on a parking lot on West 97th Street between Amsterdam and Columbus avenues, is permitted under existing local zoning laws. But residents who oppose the project say the public review process is their only chance to voice concerns about a development that many in the neighborhood don't know about. "The neighborhood needs the opportunity to know the full scope of this, and they don't because it's being kept secret," said local Avery Brandon, who lives directly across from the site. "It needs to be more transparent." Though the project has been in the works for years, Brandon had no idea a brand new high-rise was planned for her block until about a month ago when she saw a story on DNAinfo, she said. At first she was disappointed that the new building would block her view. Her concern grew when she realized her kindergarten-age daughter's school, P.S. 163, was right next door to the construction site. "I just don't think these little kids are going to be able to learn," Brandon said. That's not the only worry local residents have. They say the high-rise nursing home will bring too much traffic to an already congested block, a popular route for trucks and other vehicles traveling to the east side. Aside from P.S. 163, the block is also home to a loading area for a Whole Foods, a health clinic, and several underground parking garages. Neighbors have opposed the project for years, ever since JHL first announced plans to replace its aging West 106th Street campus — parts of which date back to the 1880s — with a $250 million state-of-the-art building that will feature the latest innovations in elder care. Originally Jewish Home Lifecare wanted to sell part of its West 106th Street property to The Chetrit Group, a residential developer, then use the proceeds to build a new building on West 106th Street. That plan was ultimately dropped, and Chetrit and JHL worked out a new deal to swap Jewish Home Lifecare's West 106th Street site for vacant property that Chetrit owned on West 100th Street, where JHL wanted to build its new facility. Neighbors rallied against that plan, and when JHL moved the proposed project to West 97th Street, locals continued to fight it. Jewish Home Lifecare has made a number of changes to help lessen the project's impact on the neighborhood, Geto said. JHL originally wanted to build a 24-story structure, but reduced the size to 20 stories. The new facility won't have nearly as much traffic as JHL's West 106th Street facility because it won't host an adult daycare program that ferries hundreds of seniors to and from the site daily in buses and vans, Geto said. He added that traffic at the West 100th Street won't be as congested at JHL's West 106th Street facility — where cars, taxis and ambulettes often double park outside — because there's a driveway vehicles can pull into. At the request of residents, JHL has also filed an application with the State Department of Health for a new "certificate of need," a process that triggers public hearings about the development, Geto said. JHL will also work with Community Board 7 to create a construction committee and 24-hour hotline to respond to complaints about dust or noise that could come up during building. "We're going to try to keep very open lines of communication," Geto said. "We're going to be very responsive to community concerns." Geto said JHL needs to move as quickly as possible because its deal with Chetrit calls for JHL to leave the West 106th Street by a certain date. Chetrit plans a residential development to replace JHL's West 106th Street building, Geto said. As it stands now, the West 97th Street building wouldn't be up and running until 2017, and undergoing the city's public review process would probably delay the project by at least another year or two, Geto said. "We have contractual obligations with Chetrit about when we're supposed to vacate the West 106th Street property," Geto said. "You can't say to a developer, oh well, when we get around to leaving West 106th Street you can acquire that land. There's a finite amount of time here." Community Board 7 meets at 6:30 p.m. at Congregation Rodeph Sholom at 7 W. 83rd Street and Central Park West.